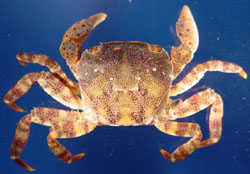 Crustaceans (Phylum Arthropoda, Class Crustacea) are found in marine, brackish and fresh waters. Common methods of introduction include ballast water discharge, intentional release as forage for sport fish, and accidental release from aquaculture facilities. Potential impacts include competition with, and predation on, native species. The opossum shrimp, Mysis relicta, was first introduced into Kootenay Lake, British Columbia, in 1949 and was widely stocked as a forage food for sport fish in the West. It is an opportunistic feeder with both predatorial and filter feeding habits. Dramatic changes in native zooplankton communities, including species extinctions, have been observed after opossum shrimp were introduced. After the introduction of the opossum shrimp into Flathead Lake, Montana, Daphnia longiremis and Leptodora kindti were reduced to undetectable levels while Diaptomus ashlandi declined more than 75% from previous levels.